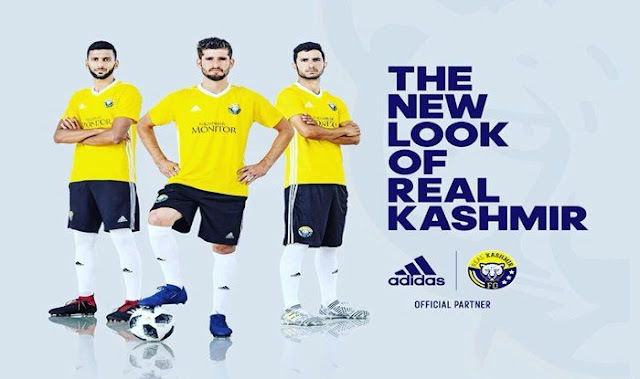 Adidas India has announced a partnership with Real Kashmir Football Club (RKFC) beginning with the 2018/2019 season which will see the brand become the Official Kit Partner for the club. Leading the way as partners beyond kit sponsorship, adidas India aims at redefining the ‘Real’ Kashmir through the lens of sports and becoming the proponent of changing lives in Kashmir through football. Real Kashmir FC has been rewriting the script of the valley with an exemplary story that aspires to bring in positive change in the state. The club earned a promotion to the 2018-19 I-League in only two years of its inception, with a victory over Hindustan FC in 2017-18 I-League 2nd Division. Furthermore, the club has a progressive vision and is the only club in the state to have a first team, and a robust academy setup which includes Under 19, 15, 13, 9 teams. Speaking on this significant partnership, Dave Thomas- Managing Director of adidas Group, India, said: “Through sport, we have the power to change lives and the Real Kashmir team is a great example of this. Real Kashmir and its players have shown dedication and perseverance under difficult circumstances and we are proud to support them as they create history”. Co-owner of the club, Shamim Meraj said: “At Real Kashmir, adidas is not just a sponsor. It is the first global believer in the talent and passion of RKFC. adidas is our partner, mentor and truly an integral part of RKFC and through that of J&K”. “With a global great like adidas as our sponsor, RKFC, is being recognised as a potential winner. adidas’ winning way will surely rub-off onto us,” added Sandeep Chattoo, co-owner RKFC. Further emphasising on adidas’ initiatives to promote football in Jammu & Kashmir, Sean Van Wyk, Senior Marketing Director at adidas India said: “As Creators, at adidas, we believe that through sport, we have the power to change lives. And what better way to make a difference than join the journey of the young and empowered Real Kashmir Football Club (RKFC). In the last decade, adidas has consistently invested and created new opportunities to inspire the young creators through various initiatives such as the FC Bayern Youth Cup and adidas Tango League, created world-class facilities like adidas Base to develop football infrastructure, as well as sponsored programs like the Mission XI Million to boost and nurture grassroots football in India. The partnership with RKFC adds to the adidas local asset portfolio which also includes some of India’s best players like Eugeneson Lyngdoh, Rowlin Borges and CK Vineeth.